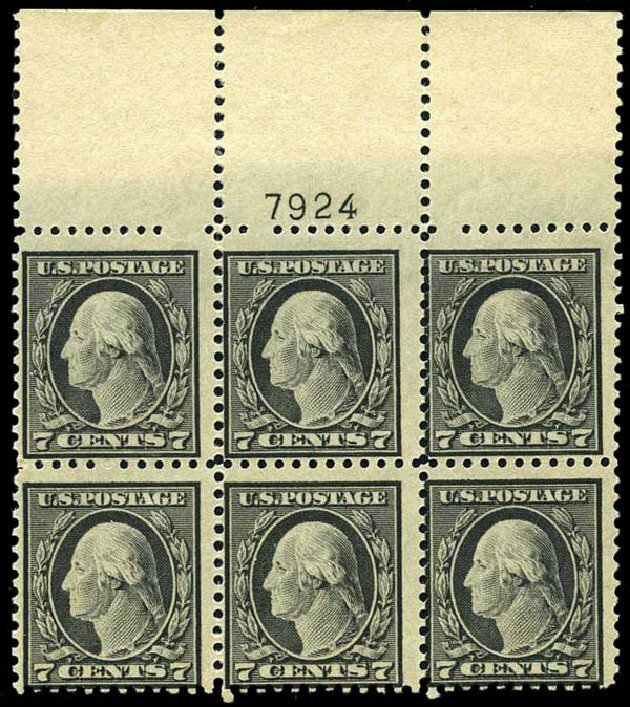 USA (Scott 507) 1917 WASHINGTON 7¢ BLACK (TOP PLATE) Top plate block of 6 (plate #F 11753). 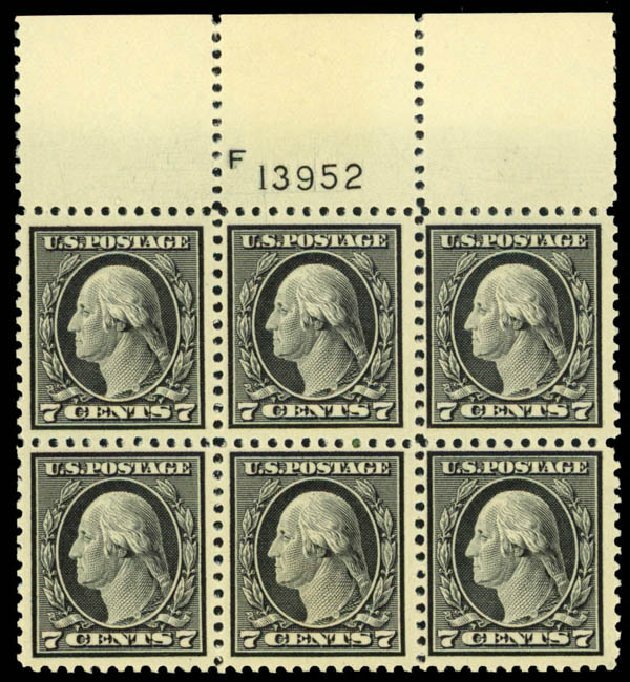 Wide top, faint toning spot top center does not affect stamps, otherwise fresh, fine to very fine. Original gum, previously hinged. Cat value $250. 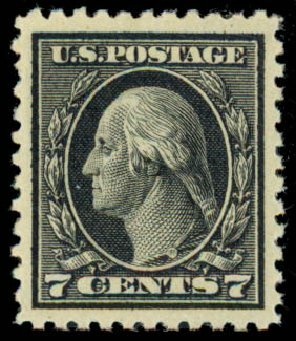 USA (Scott 507) 1917 WASHINGTON 7? BLACK Fresh, MINT never hinged, extremely fine. Cat $60. 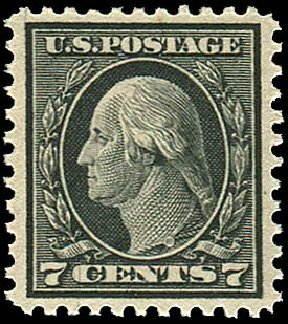 1917, 7¢ black (Scott 507), bottom plate number single, o.g., lightly hinged, tremendous showpiece with boardwalk margins and beautiful rich color, exceptional stamp, Extremely Fine to Superb, 2014 P.S.E. 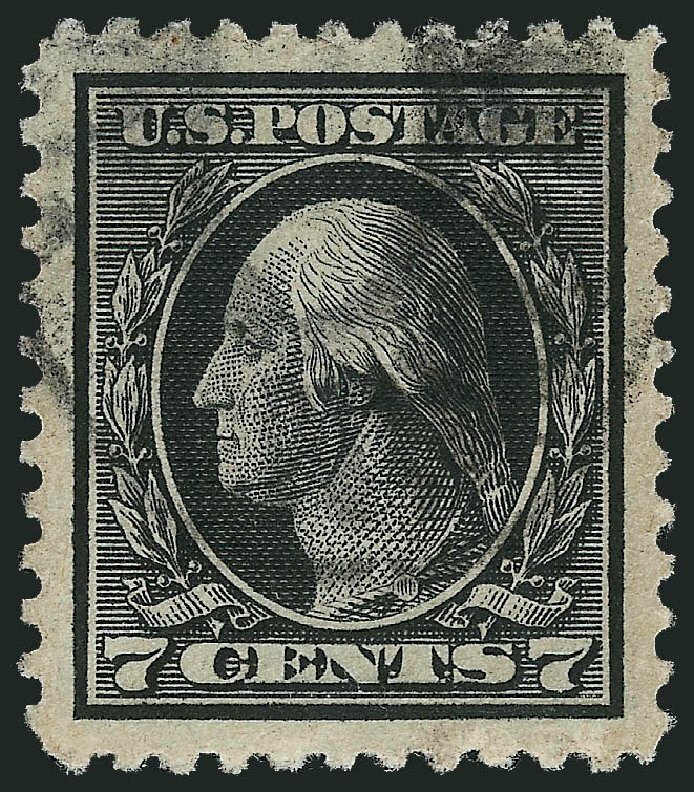 certificate graded XF-SUP-95J (1 of 2 examples at this grade, with only 13 others grading higher). SMQ $90 in the grade of XF-Sup-95. Scott $26. Estimate value $100 – 150. 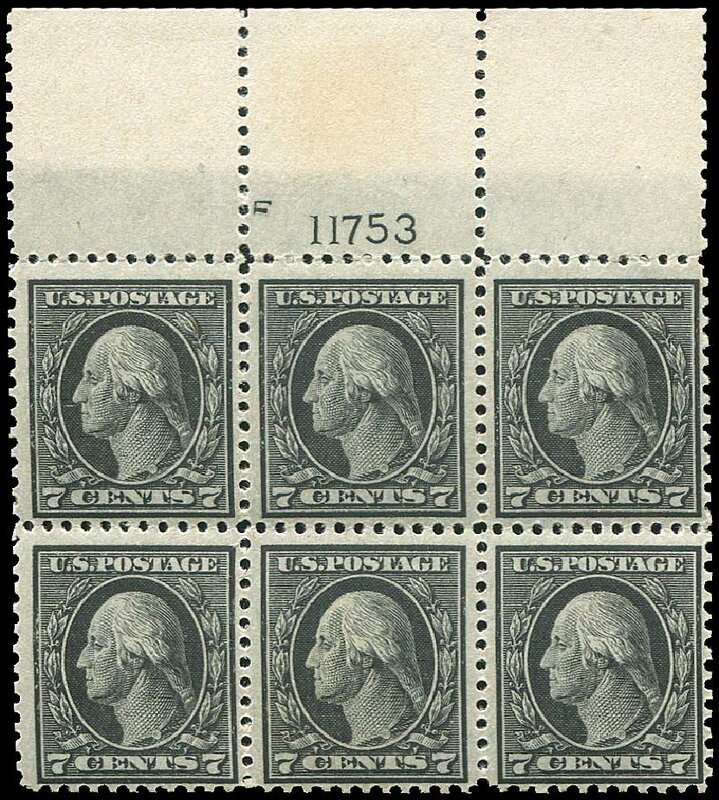 U.S. General Issues, 1917, 7¢ Black, Plate Block of 6, #507, n.h., large top #7924, ink spot in selvage, well centered, Very Fine. Scott $450. Estimate value $200-250. 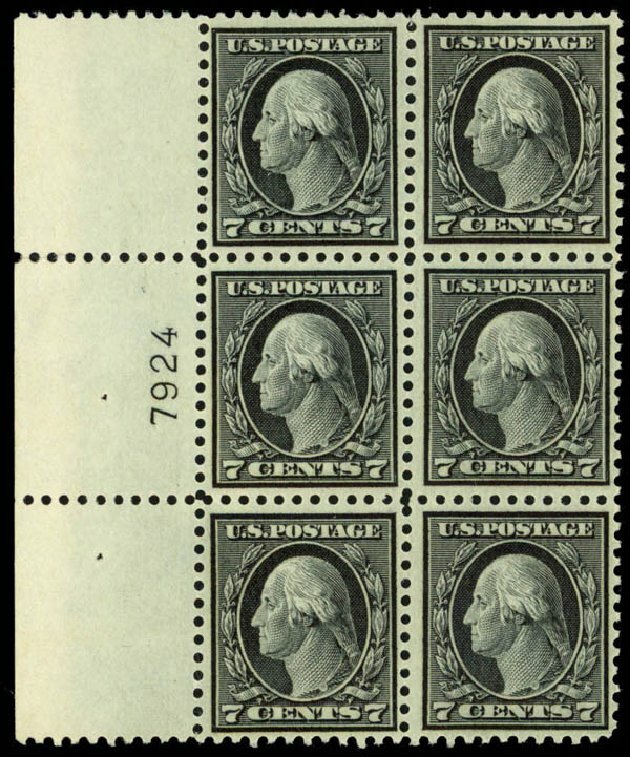 U.S.; General Issues, 1917-19, 7¢, plate block of 6, #507. L.h., large top #7924, perfs touch, Just Fine. Scott $250. Estimate value $40. 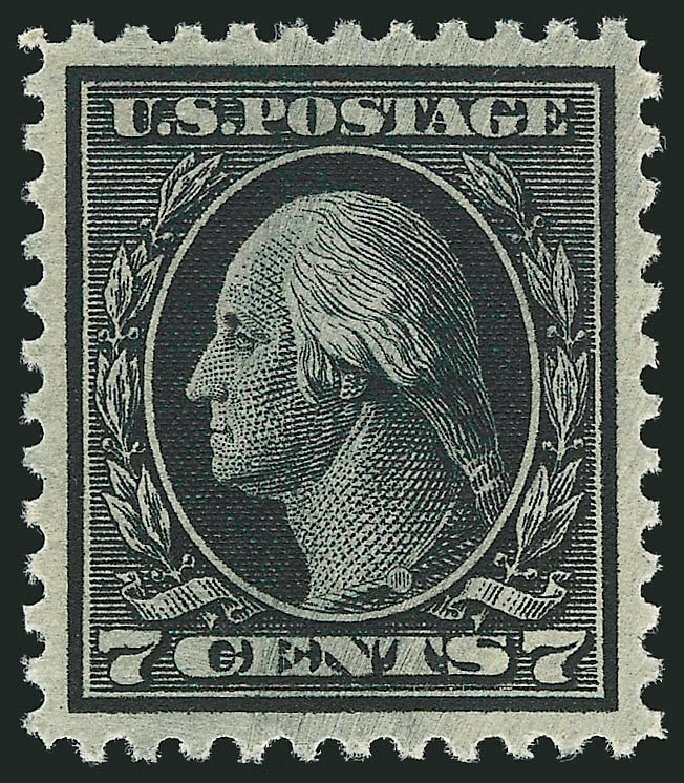 1917, 7¢ black (507), o.g., never hinged, magnificent top quality showpiece, featuring extremely large margins and prooflike color, simply amazing, Extremely Fine to Superb, 2002 A.P.S. and 2013 P.S.E. 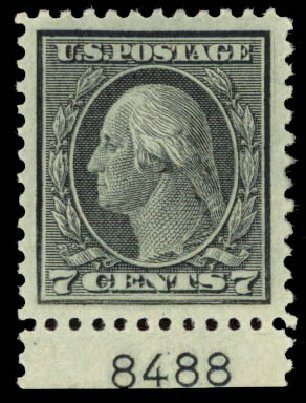 certificate graded XF-SUP-95, 1 of 40 examples at this grade. SMQ $390. Scott $60. Estimate value $300 – 400. 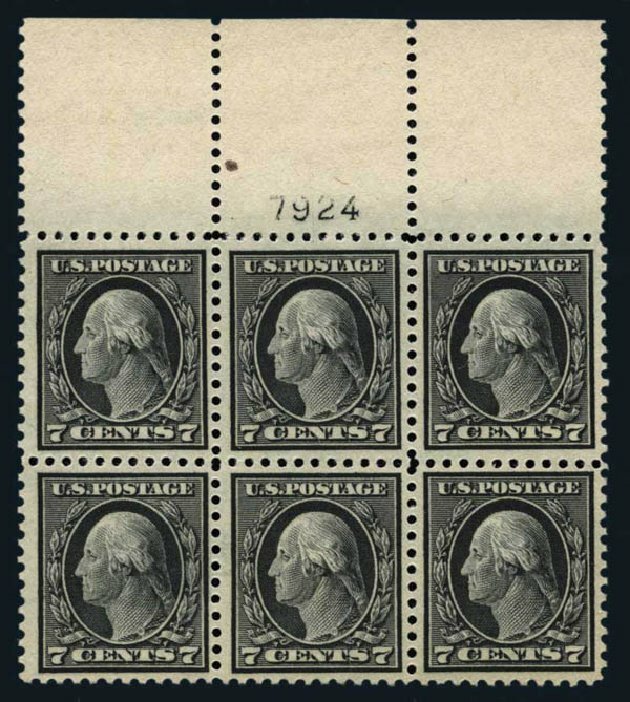 U.S.; General Issues, 1917, 7¢ black, block of 6 with plate number, #507. N.h., #13952, Fine to Very Fine. Scott $360. Estimate value $120. 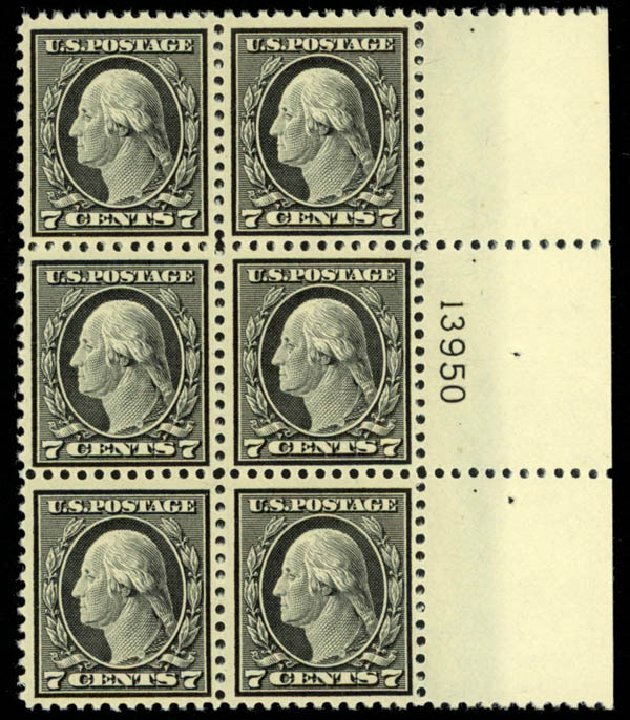 1917, 7¢ black (Scott 507), top plate block of 6, o.g., never hinged, impeccably fresh and attractive large top, with choice centering, Very Fine. Scott $450. Estimate $350 – 500. 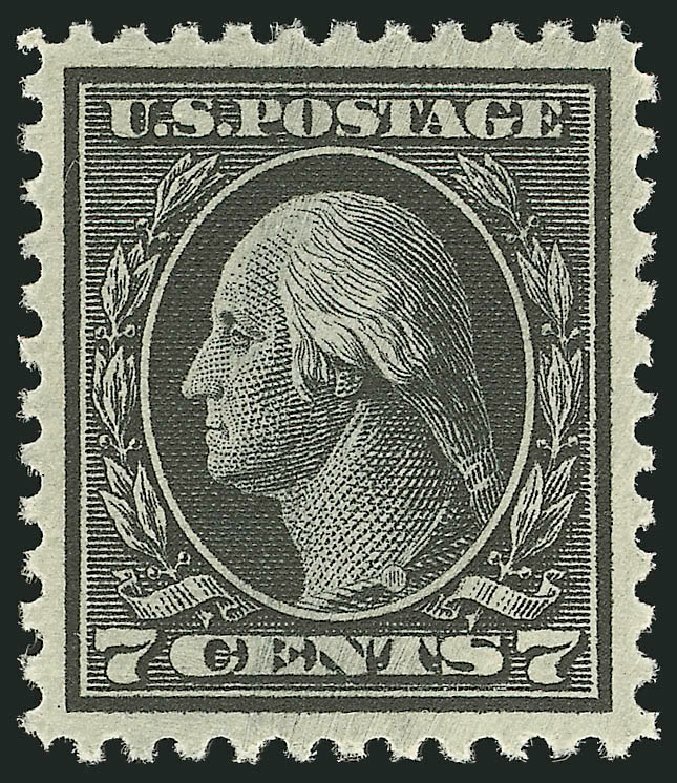 1917, 7¢ black (Scott 507), top plate block of 6, o.g., never hinged, attractive example, a naturally short bottom with bold color, Very Fine. Scott $450. Estimate price $300 – 400. 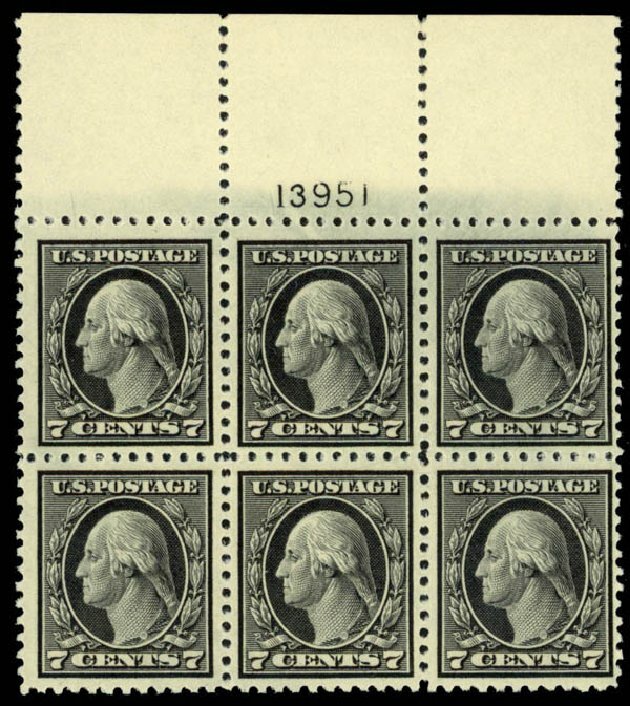 1917, 7¢ black (Scott 507), left plate block of 6, o.g., never hinged, extraordinary example of this tough plate, intense Jet-Black color and clearly defined impression, Very Fine to Extremely Fine. Scott $450. Estimate price $350 – 500. 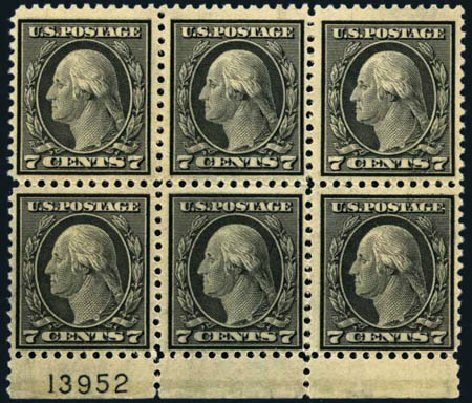 1917, 7¢ black (Scott 507), right plate block of 6, o.g., never hinged, attrcative example in immaculate condition, with lively bright color, Very Fine. Scott $450. Estimate price $300 – 400. 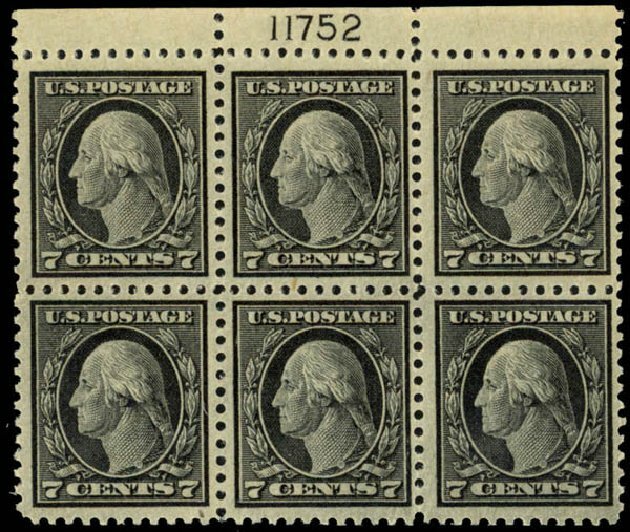 1917, 7¢ black (Scott 507), top plate block of 6, o.g., never hinged, extraordinary quality wide top, Post office fresh example, quite scarce when found in this marvelous condition, Very Fine. Scott $450. Estimate $400 – 600.